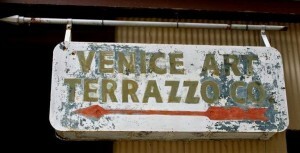 Welcome to The Venice Art Terrazzo Co. The Venice Art Terrazzo Company has over three quarters of a century in services and experience throughout this complex and yet economical flooring industry. Family owned and operated in San Antonio, Texas since 1934, we pride ourselves in our passion, expertise, and dedication to bring the art form of terrazzo to life. Our proven commitment is evident through guaranteed quality work, in a product line which ranges from the beautiful art of terrazzo, with its infinite design capabilities, to the heavy-duty, highly chemically resistant epoxy thin-set flooring systems. With our 80 plus years of experience comes high quality craftsmanship and expert knowledge in the industry. Our longevity as a company has lead us to specialize any where from large scale commercial and industrial projects, to smaller warehouses, garage floors, and residential homes. Feel free to email us at Vatco@TheVeniceArt.com or give us a call at 210-533-7231, and visit with our experts who will gladly assist you in finding a system that fits your flooring needs. We’re Featured in a Book!